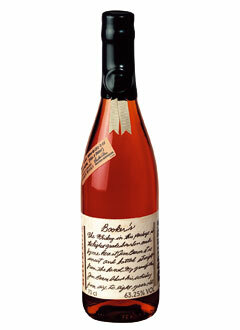 Booker’s is another member of the “Small Batch” grouping of bourbons distributed by Jim Beam and just like the Basil Hayden’s, the Knob Creek, and the Baker’s, the Booker’s is meant to offer unique and distinguishable characteristics separating the brands from the masses. And I’m all for that notion. But to me, the Booker’s misses the mark. It was a bit abrasive on first sip and there was almost an acidity to the overall flavor profile. At the time I hadn’t known much about the Booker’s but after a little research the flavor profile started to make some sense. Booker’s is said to be one of the only uncut and unfiltered bourbons bottled right from the barrel between 121-127 proof; talk about packing a punch! It’s clear that intensity is part of the equation in flavor and in effect. Because even after a little melted ice, the flavors at the forefront were of the oaky tannins more so than the richness I prefer. But honestly, it was kind of refreshing to find a bourbon that really didn’t do it for me. Maybe I’m not just a lush after all! But what about you? Anyone out there a fan of Booker’s? First off, their concept and design really tugs at my heart-strings. Anytime “enter the lab” is the first part of a whiskey related exercise, you’ve got me intrigued. But it’s not just gimmicky. At least not that I can see from their site. They offer 7 unique whiskies to be blended down to the mL quantity and even offer a little education to make sure you don’t go into the process blind. As you can see from the picture each blend you choose comes with your very own label marked with the title of your choice and the date and person who bottled it. If I had one complaint from first glance, I’d say I wish they had more than one bottle type, but that being said, that’s a damn nice looking bottle! I’m wildly intrigued by the Whiskey Blender. Any of you out there give this a shot yet? I took a trip to Kalustyan’s on my way home yesterday looking to score some of the key components for my home-made bitters project. While I was unable to find the quassia chips, I did end up with the gentian root I needed which so lovingly markets it’s ability to “clear the bowel movement” front and center. I’ve always known bitters to be a good digestive aid, but I guess I now know why. But you can’t walk out of Kalustyan’s with only the items on your list. So when I opened up my bag to unload the palm sugar, madras curry powder, and garam masala for the curry dish I was planning on cooking up, this savory cocktail hit me right over the head! It may sound odd but the flavors of the curry balance absurdly well with the whiskey. 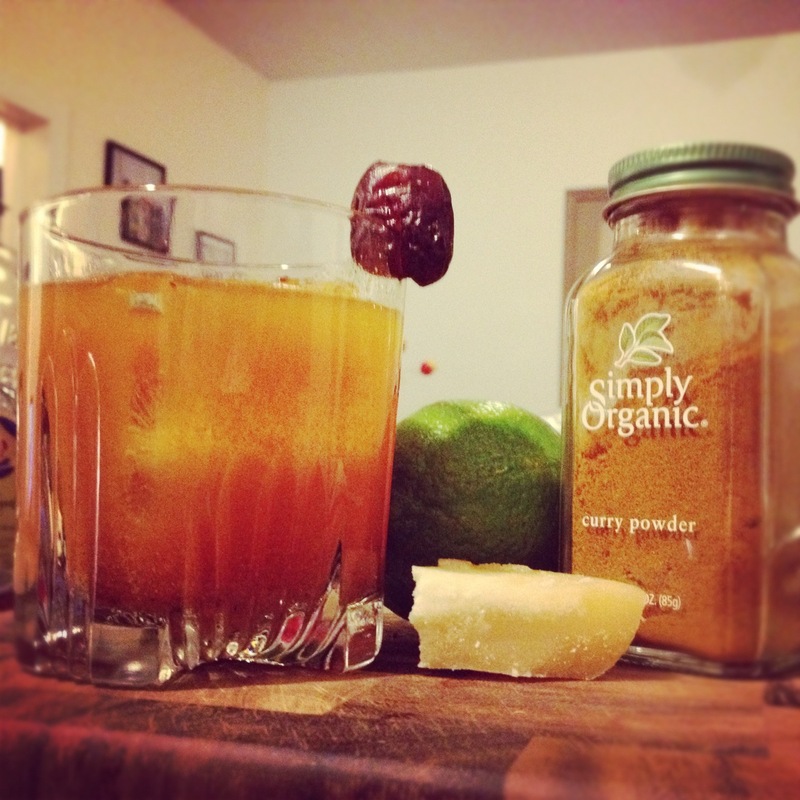 And the brightness from the lime and the heat of the chili carry the palm sugar sweetness fantastically. Next time you are in the mood for Indian grub, go BYO, and bring yourself a pitcher of these. To make the curry infused lime juice, add and stir 1 tsp of curry powder, 1 tsp of dried chili flakes, and 1 tbsp of palm sugar in the juice of one lime over low heat til thoroughly dissolved. (This recipe can be easily made in larger portions following the basic recipe) Mix the whiskey, and juice in a rocks glass with ice and finish with a splash of seltzer. Garnish with a sliced date or apricot. Awesome paired with some spicy Indian food. It’s a pretty fantastic time to be a whiskey drinker. And maybe even more so for us American Whiskey lovers. 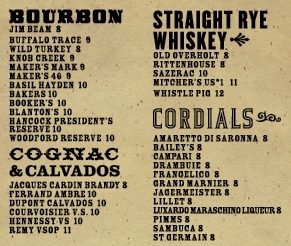 Lists like the one above from Brooklyn Bowl, are becoming quite the norm, featuring almost 20 Bourbons and Ryes as just a part of their liquor section. Even the mere fact that there is a liquor section, and not just a list of a few cloying cocktails tells you all you need to know. And the beauty of course lies in the variety. After all, it’s pretty tough to rationalize the purchase of 10 or so bottles of Bourbon for your home, simply to find your favorite. Speaking of favorites, Basil Hayden’s now got my attention. I shouldn’t be surprised as most of the Bourbon drinkers I know love the stuff. But for whatever reason, I’ve always missed out on ordering it. That was until Friday when I paired my first glass with some Brooklyn Bowl Fried Chicken. There are two characteristics of the Basil Hayden that really hit home for me. First, it’s one of the lighter small batch Bourbons out there sitting right at 80 proof making for a particularly smooth finish. The subtle sweetness of the bourbon is highlighted by a slightly higher than usual rye concentration in the mash which adds some real awesome complexity. The funny thing is I couldn’t think of anything better to pair with the Hayden then the fried chicken. The salty richness had me going back and forth from whiskey to chicken just like a wine lover would with a glass of cab and a filet…Yeah, I agree the whiskey, fried chicken combo sounds much more appealing huh. But seriously, I think the Basil Hayden is perfect for a meal both in flavor and in intensity. Anyone else a fan of the Basil Hayden? But no one said I could only choose one vice (I am making this up after all). So after I was done stocking up on all that red wine, I’d make my way to every liquor store in the area picking up as many unique bottles of American Whiskey I could get my hands on. Glass by glass, I’d sip smirking in irony at the wasted talent of our booming distilleries! So what about you guys? Choose your booze…wisely…and leave a comment below. Long live the Nobler Experiment! Saturday night, while the Tim Tebow saga was abruptly coming to an end, we made our way over to the brand new, The Wayland down in Alphabet City for the prospect of applewood smoked moonshine and a kale and ginger margarita. You can see how I was intrigued, particularly because the location of The Wayland would imply an atmosphere more suited for the Nobler Experiment compared to some of the “go-to” and “must be seen at” cocktail establishments of the city. In large part, I think The Wayland hits the mark. While it was quite crowded, we still managed to find a spot to sidle up against the bar for a few drinks which were both unique and flavorful. Cash only makes for a potential calamity when it is as cold as it was and they unfortunately ran out of their “moonshine” which was disappointing. But from what I hear, their “moonshine” takes its cues from the traditional “apple pie” style in which corn liquor is cut with apple juice and cinnamon sticks leaving you with a potent yet flavorful concoction. Except at The Wayland, they take it one step further. 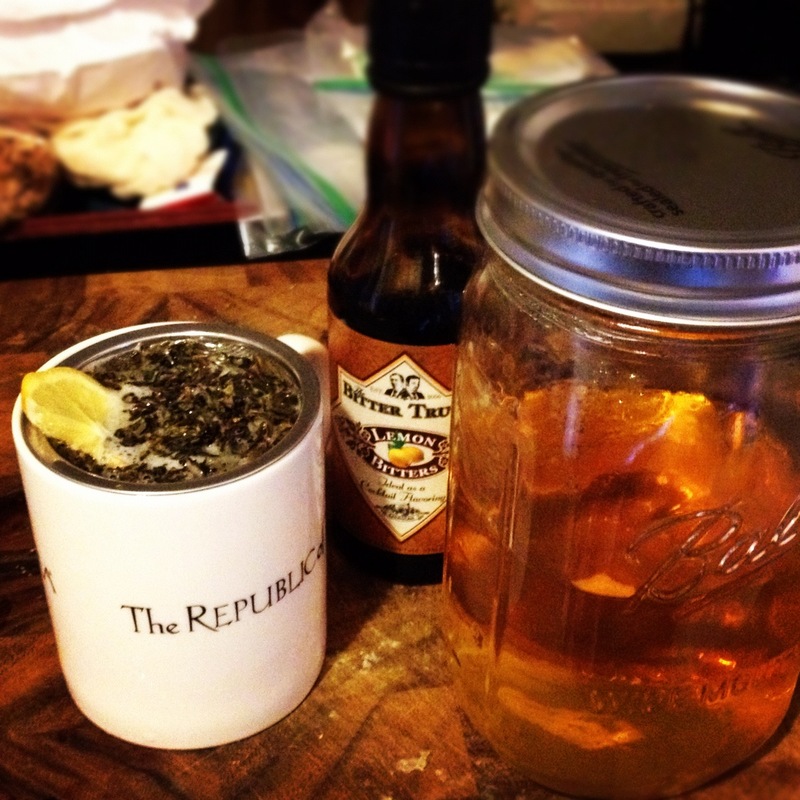 By smoking some applewood over top of the cocktail and topping it all with a tumbler, the aroma becomes a major part of the experience. At least that’s what they are shooting for. As I mentioned, they ran out, so next time! As for the other drinks, the menu is set up by liquor type. Rum, bourbon, gin, and tequila were available in distinct cocktails which I can only assume varies over time. My bourbon drink incorporated an old school method of incorporating an egg white. Much like some of the old fashion fountain drinks, the egg white added some richness to an otherwise simple cocktail. It was good, but felt like it was missing something. As for the other three we tried, the tequila cocktail (kale and ginger margarita) was by far the most interesting. Much like I do with the Juice Bar Blends, the point of this drink was a clear focus on the namesake ingredients. The flavors were strong and the drink was delicious. 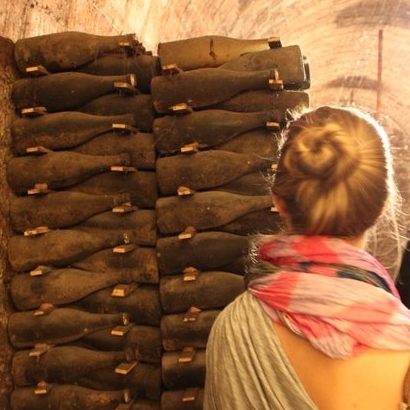 Not sure how many of these you could drink in a row before feeling a bit overly “vegetated”, but it was unique and for sure worth a try. I’m really excited to head back on a weeknight where I plan on trying a few of their other drinks (which I assume vary from night to night like I mentioned…does anyone know for sure if this happens?). I’m also seriously intrigued by their food menu. Small plates of seemingly everything I would want to eat. Braised meats, smoked trout, oysters and charcuterie plates. Are you serious? Did they make this place for me? The spot has a real southern vibe to it, and was rocking some fantastic music. Looking forward to another trip to The Wayland. Since the last Nobler Gathering, I’ve had quite a few Irish Coffees. But after tasting how good my homemade spiced rum came out, the Pirate’s Tea Party seemed like an even better option. This one’s a simple drink. For simple occasions. The black tea plays off of the bay leaf, cardamom, and cinnamon and the slight sweetness from the apples and vanilla. A few dashes of lemon bitters and you are good to go. If I read the Sunday paper, this is the drink I’d pair it with. You are currently browsing the The Nobler Experiment blog archives for January, 2012.